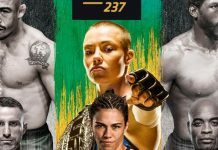 Last night, in the co-main event of UFC on Fox 24, strawweight star Rose Namajunas dominated the dangerous Michelle Waterson to a second-round submission win, establishing herself as the division’s top contender as she did. Having done so, she can now probably look forward to a fight with the winner of UFC 211’s Joanna Jedrzejczyk vs. Jessica Andrade title fight sometime later this year – at least, that’s her hope. Speaking to the media in the moments after UFC on Fox 24, Namajunas explained that her goal is to capture the UFC strawweight title before the year is out. 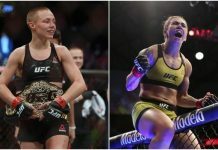 While Namajunas’ title shot is not official just yet, UFC President Dana White seems to be into the idea. With her defeat of Waterson, Namajunas improved her overall record to 6-3. 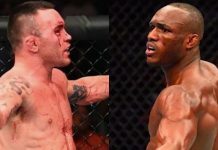 The win separated her from a close decision loss to recent title challenger Karolina Kowalkiewicz, which occurred all the way back in July of 2016. Jedrzejczyk and Andrade will battle for strawweight gold in the co-main event of UFC 211 on May 13. 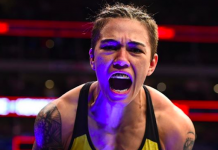 Do you think Rose Namajunas is ready for a shot at the winner?